The world you know is topsy-turvy, it has been undone, and re-arranged with maximum ironic impact. It makes perfect sense. The cradle of civilization became the cradle of representative democracy, and the United Arab States rose to pre-eminence while North America never got beyond being a collection of feudal theocracies. 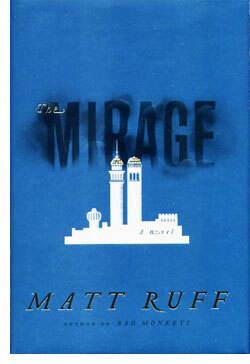 Matt Ruff's 'The Mirage' begins with on November 89, 2001, when Christian fundamentalist terrorists hijack four jetliners. Two go into The Tigris & Euphrates World Trade Towers in Baghdad, a third into the Arab Defense Ministry in Riyadh, while a fourth is brought down by its passengers before it hits Mecca. Three cops — Samir (big, burly and blunt), Amal (the Mayor's daughter) and Mustafa (late on the scene) are busting an alcohol smuggler when they witness the event, and feel the world change beneath their feet. If 'The Mirage' were not so finely written, one would be tempted to say that it was an audacious work, with a premise that teeters on the verge of jingoistic parody. But it takes only a paragraph to realize Matt Ruff is such a fine writer that he can simply immerse you in a gritty, detailed alternate reality that rings utterly true with every word. Ruff's prose carries us into and through a world that feels real. The sentences are beautifully crafted, the dialogue flows effortlessly and every word contributes to the world. If the plot were not so intriguing, 'The Mirage' would work alone as wonderfully imagined piece of literary fiction. The novel proper begins ten years after the 11/9 event, when Amal, Mustafa and Samir are working the War on Terror. A captured "homicide bomber" reveals that his Christian sect believes the world to be a mirage, and that in the real world, America is the superpower — and he's got a New York Times dated 9/12/01 to back him up. Of course, the three cops know it to be a Photoshop job, but as they dig deeper into the world of false artifacts, they find themselves surrounded by friends who might be enemies. No matter what the world, the truth is always hazardous to your health. Characters drive 'The Mirage,' and Ruff gives us deeply written protagonists who are compelling almost-mirrors of our world. Amal, Mustafa and Samir all have wonderfully drawn everyday problems and challenges in their family and public lives that are both familiar and exotically strange. Ruff's meticulously crafted alternate history is populated with extremely entertaining versions public figures in our world, from Saddam Hussein to Osama Bin Laden that are a hoot to read about. The thriller plot is expertly used to pull them together, and Ruff's finale is every bit the ending that the novel deserves. The power of 'The Mirage' is the power of the mirror; it's an enchantment and a curse. Ruff's prose makes us take his world and his characters with the gravity they deserve, but in a manner that is extremely fun to read. Every detail of the world he creates is exciting and new, to the degree that our unfolding understanding of the world is a plot driver. It's important to remember, though, the title. 'The Mirage' is a vision, but the more we see this alternate reality, the more we understand about our own. The novel is a very smart mirror. Enchantment gives way to curse; we see ourselves both in the other and as the other.